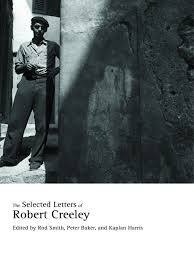 The Selected Letters of Robert Creeley is an engaging, thoroughly worthwhile selection of the poet’s correspondence spanning his complete life. The editorial work done here is quite impressive. The only areas to be possibly improved upon would be further notes in the back of the book and more illustrations. The letters span some sixty odd years, so although Creeley is perhaps one of the greatest over-photographed poets of our time it seems appropriate to have at least one photograph per decade. As it is there’s about three, including the photo on the cover. It is admittedly difficult to locate yet-unseen images of him, but several pages of reproduced letter manuscripts or perhaps images of this or that difficult to obtain publication would have sufficed instead. And it proves difficult not to wish for some further elaboration upon the minimal notes included. Not every reader has the book open next to the computer to take advantage of Wikipedia and Google. Yet as stated the overall skilled arrangement of the whole book is such that these are minor quibbles. Creeley himself well understood the massive assembling project that any selection of his letters represented. Writing to editor Rod Smith, Creeley describes his sense of how “some general ‘map’ or sense of focus or parameter would be the first need.” He then immediately suggests the then-recent “selection of [Charles] Olson letters–or Gregory’s, just out from ND” as some examples of what he has in mind as successes. The latter volume, An accidental autobiography: the selected letters of Gregory Corso (New Directions “ND” 2003), I fondly recall a poet-pal curling up with in bed while down LA’s Chinatown for a reading, a small group of us having driven down for the event. Creeley’s Selected, however, easily outshines my experience of reading Corso’s correspondence. This is no small feat given that so little is readily available concerning Corso, while material on Creeley is quite plentiful. I say this having an equal interest in both poets and having read ALL available material on each of them. Corso’s letters, for all his charm, are just too repetitive. They round out the experience of his poems but are ultimately as inhibited by his vices as the poems too often sadly prove to be. On the other hand, Creeley’s letters truly offer all that any of his readers might imagine and more. Not that Creeley didn’t indulge his share of vices: mention of numerous illicit substances make repeated revolving door appearance in the letters as do his (nearly) overlapping romances and marriages. As a persistent reader of all things Creeley I would have thought there was little to be newly discovered about his life and writing. But the letters quickly prove just how wrong it is to make such an assumption. The simplest of fresh things I’ve come across is Creeley’s repeated use of “voila” throughout his correspondence. He’s usually using it as a turn of phrase to sum up his recounting of some recent excitement to a correspondent. Often it occurs near either the conclusion of the entire letter or some lengthy passage in particular, as if to say “see what I mean! And so now:” before continuing on to his next thought. This reoccurring word appears early on in the letters and at first had me thinking it was something he just tried out which would then disappear as time went by; but I found it continued throughout decade after decade. This caught my attention because it is not a regularly used figure of speech I’ve found in any of Creeley’s other writings, poems, published interviews, essays, etc. where appear an abundance of what I term Creeleyisms. Familiar phrasal patterns to which he easily returns over and over again, yet the “voila” is present just in his correspondence. My new found Creeleyism: Voila.